I often start January with a series of “good luck” foods. The Christmas cookies, champagne and caviar are long gone and it’s time to get down to the business of resolutions and a fresh, healthy start to the year. Since a trip to Umbria in 1990 where I sampled the local lentils cooked into a simple but stellar soup, I’ve made Italian lentils part of my January series of dishes. Lentils look like little lira coins so they are traditionally eaten to launch the New Year for good luck and prosperity. This tradition is not unlike the American tradition of hoppin’ John for the New Year where the black eyed peas signify coins and the collard greens bills of money. The Italians serve the lentils with pork sausage because, as I’ve read, fatty sausage represents a fat wallet and pigs are known to “root forward” unlike other animals, indicating a positive direction for the upcoming year. My food traditions lean to the lean so I take liberties with the Italian way and substitute poultry sausage for the typical Italian Coetchino sausage from Modena. I brought home a bag of Umbrian lentils from Catellucio but they remain hard to find and pricy here in the United States. 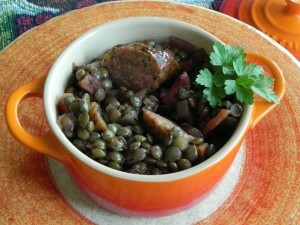 I often use the French green lentils, Lentille du Puy, another variety I learned to love when I living France. Spanish Pardina lentils would also work well but are also hard to find. Red or yellow lentils are best saved for soups as they are decorticated (hulled) and cook down to a puree. If you use common brown lentils, avoid overcooking them or they will also become a puree. This recipe is such a favorite that we use it throughout the year, replacing the sausage with grilled wild salmon and adding chopped, pitted kalamata and a squeeze of lemon to the lentils. To go with sautéed scallops I swap the red wine for white and shower all with a sprinkle of crumbled bacon (extra lean, nitrate/nitrite free bacon of course). 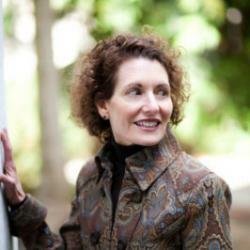 For a vegan or Meatless Monday meal, try adding quartered dried figs. Easy Nutrition: The lentil, with 9 grams of protein per half cup cooked (more than an egg or a cup of milk) also provides iron, calcium, copper, magnesium and zinc. And unlike other legumes, the little lens-shaped legume requires no overnight soaking or can-opening like its larger cousins. In a hurry? Lentils cook in 15 to 25 minutes. On a budget? You’ll look hard to find a better deal on cost per total nutrient density. Stay tuned for more lentil recipes. Like a good soup or stew, these lentil are even tastier reheated a day after cooking. Make a double batch to insure you have leftovers. In large saucepan, combine lentils, water, 1 teaspoon salt and bay leaf. Cover and bring to a boil over high heat. 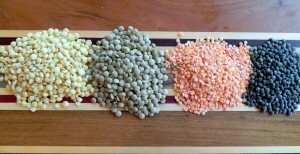 Reduce heat and simmer 15 to 20 minutes or until lentils are tender but still hold their shape. Drain lentils, remove and discard bay leaf and set aside. Heat medium skillet over medium heat; add oil, onion, carrot, rosemary and garlic. Cook stirring occasionally, until onion is soft, 8 to 10 minutes. Add drained tomatoes and wine. Bring to a simmer and cook until most but not all of the liquid evaporates, stirring often, 3 to 5 minutes. Add lentils. Cook and stir until lentils are warm, about 2 minutes. Season to taste with additional salt and pepper, if desired. Sprinkle with parsley. Serve warm. Makes 4 servings. Sausage: While lentils cook, sauté 1 pound lean Italian sausage in an oiled pan (or grill), turning once or twice, until browned and cooked through. Serve whole or sliced with lentils. Figs: Add 1 cup chopped dried figs along with tomatoes. Scallops & Bacon: Omit sausage. Use white instead of red wine. Use fresh thyme instead of rosemary. Sauté scallops instead of sausage and serve over lentils. Sprinkle with cooked, crumbled bacon, if desired.